Nebraska wide receiver Tim Marlowe (6), athletic director Tom Osborne and running back Rex Burkhead (22) lead the Huskers out of the tunnel at Memorial Stadium on Saturday, Nov. 17, 2012. 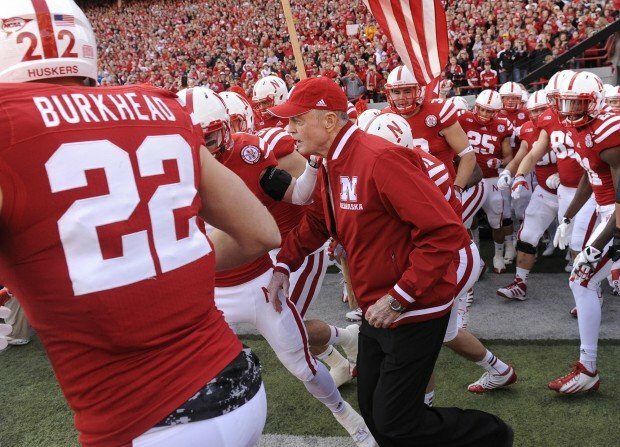 Nebraska athletic director Tom Osborne takes the field with the team at Memorial Stadium on Saturday, Nov. 17, 2012. Nebraska head coach Bo Pelini, left, and athletic director Tom Osborne lead the team out at Memorial Stadium on Saturday, Nov. 17, 2012. Nebraska head coach Bo Pelini and senior linebacker Alonzo Whaley (45) embrace before the game at Memorial Stadium on Saturday, Nov. 17, 2012. Nebraska athletic director Tom Osborne, left, and head coach Bo Pelini take the field at Memorial Stadium on Saturday, Nov. 17, 2012. This the last home game of Osborne's tenure as athletic director at Nebraska. Nebraska head coach Bo Pelini fires up his team, including athletic director Tom Osborne, prior to the game at Memorial Stadium on Saturday, Nov. 17, 2012. Nebraska senior Baker Steinkuhler gets a bear hug from head coach Bo Pelini before the game at Memorial Stadium on Saturday, Nov. 17, 2012. Nebraska quarterback Taylor Martinez (3) sets himself up next to his blocker, tight end Ben Cotton (81), in the second quarter at Memorial Stadium on Saturday, Nov. 17, 2012. Minnesota running back Donnell Kirkwood (20) is upended by Nebraska cornerback Ciante Evans (17) in the first quarter at Memorial Stadium on Saturday, Nov. 17, 2012. Nebraska head coach Bo Pelini shares a moment with senior Rex Burkhead before the game against Minnesota at Memorial Stadium on Saturday, Nov. 17, 2012. Nebraska running back Imani Cross (32) scores in the second quarter against Minnesota at Memorial Stadium on Saturday, Nov. 17, 2012. Nebraska defensive end Eric Martin (46) can't break away from Minnesota offensive linesman Ed Olson (58) as Martin lunges at Minnesota quarterback Philip Nelson (9) in the first quarter at Memorial Stadium on Saturday, Nov. 17, 2012. The Husker defense swarms Minnesota running back Donnell Kirkwood (20) in the first quarter at Memorial Stadium on Saturday, Nov. 17, 2012. Nebraska defensive end Jason Ankrah, left, grabs for Minnesota quarterback Philip Nelson (9) in the first quarter at Memorial Stadium on Saturday, Nov. 17, 2012. Nebraska wide receiver Kenny Bell (80) cradles a first-quarter touchdown catch against Minnesota defensive back Michael Carter (23) at Memorial Stadium on Saturday, Nov. 17, 2012. Minnesota tight end John Rabe (81) is separated from the ball by Nebraska linebacker Will Compton (51) in the first quarter at Memorial Stadium on Saturday, Nov. 17, 2012. Nebraska running back Ameer Abdullah (8) is ready to take on a would-be Minnesota tackler in the first quarter at Memorial Stadium on Saturday, Nov. 17, 2012. The east stadium spelled out "THANKS TOM" for retiring athletic director Tom Osborne at Memorial Stadium on Saturday, Nov. 17, 2012. Minnesota quarterback Philip Nelson (9) goes down in the grasp of Nebraska cornerback Ciante Evans (17) in the second quarter at Memorial Stadium on Saturday, Nov. 17, 2012. Nebraska wide receiver Jamal Turner (10) and wide receiver Kenny Bell (80) celebrate Bell's touchdown in the first quarter at Memorial Stadium on Saturday, Nov. 17, 2012. Nebraska quarterback Taylor Martinez (3) looks for a receiver in the first quarter against Minnesota at Memorial Stadium on Saturday, Nov. 17, 2012. Nebraska running back Imani Cross (32) scores for the second time against Minnesota in the second quarter at Memorial Stadium on Saturday, Nov. 17, 2012. Minnesota defensive back Michael Carter (23) can't stop an acrobatic catch by Nebraska wide receiver Quincy Enunwa (18) in the second quarter at Memorial Stadium on Saturday, Nov. 17, 2012. Nebraska running back Ameer Abdullah (8) tries to outrun Minnesota defensive back Michael Carter (23) in the third quarter at Memorial Stadium on Saturday, Nov. 17, 2012. Nebraska wide receiver Kenny Bell (80) fends off Minnesota defensive back Derrick Wells (13) in the third quarter at Memorial Stadium on Saturday, Nov. 17, 2012. Nancy and Tom Osborne with their family at halftime at Memorial Stadium on Saturday, Nov. 17, 2012. Nebraska cornerback Stanley Jean-Baptiste (16) outruns Minnesota wide receiver Devin Crawford-Tufts (80) to return an interception for a touchdown in the third quarter at Memorial Stadium on Saturday, Nov. 17, 2012. Nebraska wide receiver Kenny Bell (80) gets stopped by Minnesota defensive back Michael Carter (23) just short of the end zone in the second quarter at Memorial Stadium on Saturday, Nov. 17, 2012. Nebraska running back Imani Cross (32) gets stopped by Minnesota linebacker Mike Rallis (26) as he tries to stretch himself over the pile in the second quarter at Memorial Stadium on Saturday, Nov. 17, 2012. With Minnesota linebacker Keanon Cooper (4) hanging on him, Nebraska running back Ameer Abdullah (8) can't reach a second-quarter pass at Memorial Stadium on Saturday, Nov. 17, 2012. Nebraska wide receiver Kenny Bell (80) sprints away from Minnesota defensive back Michael Carter (23) in the second quarter at Memorial Stadium on Saturday, Nov. 17, 2012. Nancy and Tom Osborne and family at halftime at Memorial Stadium on Saturday, Nov. 17, 2012. Nebraska wide receiver Kenny Bell (80) makes a second-quarter catch in front of Minnesota defensive back Troy Stoudermire (2) at Memorial Stadium on Saturday, Nov. 17, 2012. Nebraska cornerback Stanley Jean-Baptiste (16) intercepts a third-quarter Minnesota pass and returns it for a score at Memorial Stadium on Saturday, Nov. 17, 2012. 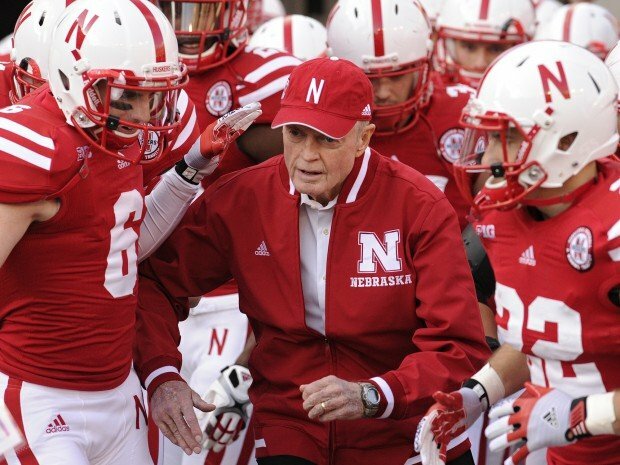 Tom Osborne waves to the crowd during halftime at Memorial Stadium on Saturday, Nov. 17, 2012. Nebraska safety Daimion Stafford (3) steals the ball from Minnesota wide receiver Andre McDonald (12) for a third-quarter interception at Memorial Stadium on Saturday, Nov. 17, 2012. Nebraska quarterback Taylor Martinez (3) tries to pull away from Minnesota defensive back Derrick Wells (13) in the third quarter at Memorial Stadium on Saturday, Nov. 17, 2012. Nebraska quarterback Taylor Martinez watches from the sideline during the fourth quarter against Minnesota at Memorial Stadium on Saturday, Nov. 17, 2012. Former Husker coach and congressman Tom Osborne has interesting insight into Twitter, Donald Trump and recruiting. Nebraska quarterback Taylor Martinez (3) has been on a mission in recent weeks. Can he finish it off against the Hawkeyes? Nebraska cornerback Stanley Jean-Baptiste (16) outruns Minnesota wide receiver Devin Crawford-Tufts (80) to return an interception for a touchdown during their game at Memorial Stadium on Nov. 17, 2012. Jean-Baptiste is one of several veterans trying to win starting cornerback positions with the Huskers. Nebraska wide receiver Jamal Turner makes a first-quarter catch at Memorial Stadium against Minnesota last season. The junior wideout is a member of what could be the best receiving corps in the Big Ten. Stanley Jean-Baptiste intercepts a Minnesota pass before returing it for a touchdown at Memorial Stadium on Saturday, Nov. 17, 2012. After Tuesday's practice, head coach Bo Pelini said the senior cornerback is having the best week he's had at Nebraska. Nebraska wide receiver Kenny Bell (80) fends off Minnesota defensive back Derrick Wells (13) in the third quarter at Memorial Stadium on Saturday, Nov. 17, 2012. Bell is considered one of the fastest players on the team. Taylor Martinez threw for 308 yards and two touchdowns to Kenny Bell while becoming No. 16 Nebraska's all-time passing leader in a 38-14 victory over Minnesota on Saturday. Senior Day came with several tributes at Memorial Field on Saturday, with 29 seniors honored as well as the man who helped make Husker football what it is today -- Tom Osborne. If Tom Osborne's Tunnel Walk tribute didn’t give you goose bumps and send a chill down your spine, please consult a doctor and get your pulse checked.